Kinder is a line of Italian chocolate by Ferrero that has a pretty wide distribution. It’s pretty popular all over Europe and you can find several varieties, including Kinder Bueno and the infamous Kinder Surprise, here in the United States. I spotted this Kinder Country in a local store and decided to give it a try. The bar is exactly as it’s illustrated on the box: milk chocolate filled with a milky center and cereal pieces. Upon opening the wrapper, the bar has that nice sweet dairy smell that is so common with European chocolates. The taste is up there too: sweet with a strong powdered milk flavor. The creme interior is indeed milky. The texture is a bit fluffy; it feels more like a whipped nougat than creme. The cereal pieces add a nice light crunch and a subtle salty hit. So overall this European version of a Nestle Crunch/Hershey’s Krackel bar is a nice change of pace. It’s good for when you’re in the mood for something different but want something familiar and reliable. It’s a shame that you only mentioned Kinder Bueno in passing, because it happens to be the best tasting candy bar, ever. I found this out in a trip to Germany several years ago. It deserves a full review. It’s like a twix because there are two bars inside the outer wrapper, but each are individually wrapped in case you want to save one. Then inside each bar there are these chocolate covered wafer cookie bubbles filled with delicious hazelnut cream. Dynomite!!! Oops. Just noticed that there already is a review for Kinder Bueno on Candy Addict. It didn’t do the Bueno justice though. Dynomite it tell you! Oh, I love the Kinder Country! I’m a fan of Kinder living in the southeast, and you have NO idea how hard it is to get your hands on Kinder in my region. Kinder was born in 1968 by an idea of Paolo Ferrero that wanted to promote a healty and tasty line of products dedicated to children. He called the brand Kinder because of the marketing. In Italy is a very common strategy use not italian names to score the public. In Italy we have many Kinder products, when I was in the U.S. I couldn’t fin the cold snacks: here we have chocolate bar filled with fresh cream, paradise cake with whipped cream, cookie wafer with fresh cream and caramel and more do you have they? and we have the summer version of the surprise egg called Kinder Merendero, that is amazing! I’m 31 and since I was a child Kinder Country (here called Kinder Cereali) is my favourite snack. Ooh, I loved the cold Kinder bar with cream. When I was in Germany I always bought one when I was at the store – it was delicious and the perfect treat on a hot day. Not freezing like ice cream, just cool enough to be refreshing. Ah, the memories…. Kinder is One of the best-ever chocolate in the world. I think all of you that have been tasted it will agree with me, right? 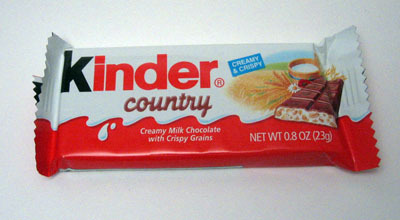 Kinder Country/ Kinder Cereal is one of the best Ferrero products in my opinion, its just the right combination..